We study a binary system composed of point particles of unequal masses in eccentric orbits in the linear regime of the characteristic formulation of general relativity, generalising a previous study found in the literature in which a system of equal masses in circular orbits is considered. We also show that the boundary conditions on the time-like world tubes generated by the orbits of the particles can be extended beyond circular orbits. Concerning the power lost by the emission of gravitational waves, it is directly obtained from the Bondi’s News function. It is worth stressing that our results are completely consistent, because we obtain the same result for the power derived by Peters and Mathews, in a different approach, in their seminal paper of 1963. 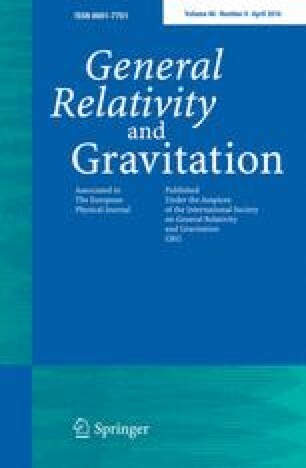 In addition, the present study constitutes a powerful tool to construct extraction schemes in the characteristic formalism to obtain the gravitational radiation produced by binary systems during the inspiralling phase. We thank the Brazilian agencies CAPES, FAPESP (2013/11990-1) and CNPq (308983/2013-0) by the financial support. We would also like to thank the referees for their helpful comments and suggestions.